A panel of independent judges selected A.P. Woodson, T A Duckworth, and Ronald Nicklaus as the 2019 honorees. A dinner on Thursday, May 9 at the Jefferson Street Inn City Grill will celebrate their historic contributions to the Wausau area business community. 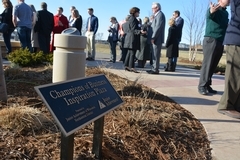 Junior Achievement of Wisconsin – Northcentral District would like to announce the new Champions of Business Inspiration Plaza. A panel of independent judges selected August Kickbush and Herb & Ervin Kolbe as the 2018 honorees. A dinner on Thursday, May 10 at the Jefferson Street Inn City Grill will celebrate their historic contributions to the Wausau area business community. Thank you for attending the 9th Annual Champions of Business! On behalf of Junior Achievement of Wisconsin, Inc., Northcentral District, we would like to express our sincere appreciation for your attendance at the 2017 Champions of Business Awards dinner honoring the George Ruder, William Sampe and Dwight Davis, individuals who have helped to build the community in central Wisconsin as we know it today. Bruce Bright will be joining the ninth annual celebration as the 2017 Champions of Business keynote speaker.